If you like the taste of adventure and want to veer off the tourist beaten track to experience the true Vietnamese culture and country, then this 5 day bike tour through the Northern mountains with Explore IndoChina is a must! 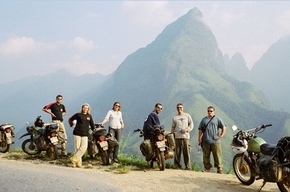 As a team of seven, largely inexperienced bikers, we arrived somewhat nervous in Hanoi to embark on our 5 day adventure. All anxieties were quickly forgotten and without fail, we all hugely enjoyed an exhilarating journey to Sapa - negotiating landslides, dodging all manner of animal life both day and night, crossing rivers by bamboo raft or nothing less than an Indiana Jones style bridge as well as some excellent offroading. The evenings were just as enjoyable with copious amounts of local lager, rice wine and delicious Vietnamese food! It is true to say that the guides either make or break a holiday of this nature and Dan & Thuan were first class. Given their fluent Vietnamese and huge personalities we were invited into homes and shared unique moments with many ethnic minorities. This write up wouldn’t be complete without highlighting the breathtaking scenery. Motorbike is the only way to get a genuine sense of this truly beautiful country not to mention remarkably friendly people. Overall, it’s an awesome feeling of freedom compared to office/city life and a unique opportunity to venture off the tourist trails. Paying up front and not worrying about cash for 5 days is a pleasant change too! Provided you are not too precious over dirt, sweat and basic accommodation, I guarantee this will rate up there with the best of your holidays.